No one warned me about postparty depression, but it's real, y'all. After months of living, breathing, planning and organizing for the wedding of my daughter, suddenly, in one glorious day it was over. The feeling didn't really sink in until yesterday. I had enough wedding euphoria to carry me through Sunday and Monday; however, by the time Tuesday rolled around, I was feeling a tad blue. Instead of moping around the house for another day, I decided to busy myself with some baking, since there's nothing quite like getting one's hands in a little flour to brighten the mood. Imen McDonnell's recently published book, The Farmette Cookbook had been laying on my kitchen table since it's arrival during all the helter-skelter of wedding planning, and I hadn't really taken the time to look through the book and dream over its recipes. I decided today was as good a day as any to delve into some Irish bread baking. Lucky for me, the traditional Irish soda bread required only four staple ingredients. The bread worked it's magic. By the time I pulled it from the oven, slathered it in lemon thyme butter and ate it with a heart-warming bowl of soup, my spirits were already lifting. I've shared the recipe below so you can bake away the blues, too. bread, fresh out of the oven. *If you don't have buttermilk, mix 1 1/2 tablespoons lemon juice to 1 3/4 cups milk as a substitution. Let it set for 10 minutes before using. In a large mixing bowl, sift together the flour, salt and baking soda. Make a well in the center and slowly pour in the buttermilk. Mix the dough with your hands, adding more milk or flour if necessary, until the texture is soft, but not wet and sticky. 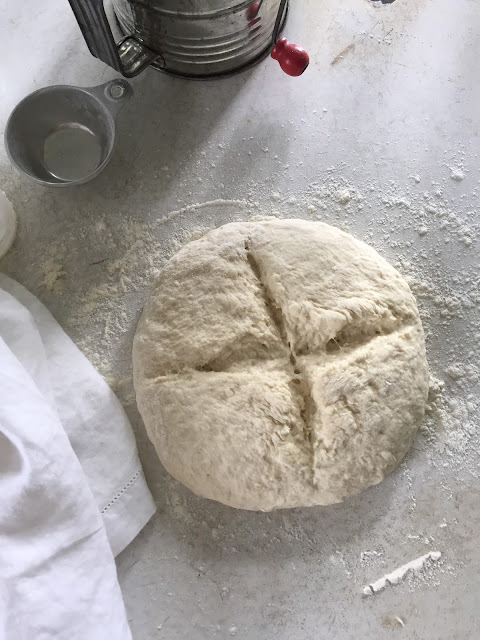 Turn the dough onto a floured work surface and shape into a 1-inch thick round. Cut a cross on the top. Place on pre-heated baking stone in oven (or a flour-dusted baking sheet) for 15 minutes. Reduce the temperature to 400 degrees F. and continue baking for 30 minutes, or until the bread is cooked through. Tap the bottom of the bread to check for doneness; if it makes a hollow sound, it is ready. Let it cool for 10 minutes and serve, slathered with butter. For more of Imen's recipes and stories, check out her blog, Farmette.